A $1.8 million coin trilogy boasting coloured diamonds found at Rio Tinto’s Argyle mine has been unveiled at the Perth Mint with international buyers already showing interest in the unique collection. 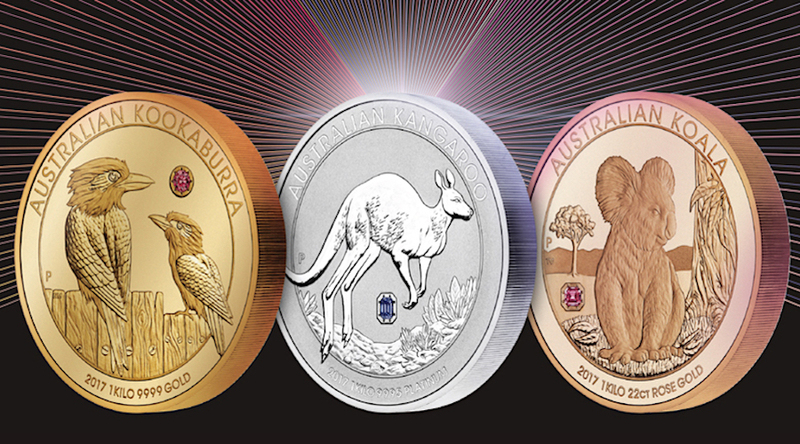 The Australian Trilogy is comprised of three one-kilogram coins struck from gold, platinum and rose gold, with each featuring a different native animal. Each of them has either a pink, purple-pink or violet diamond, which were unearthed at Rio Tinto’s (ASX:RIO) Argyle mine in the east Kimberley region of Western Australia. The Perth Mint will only ever release one of The Australian Trilogy 2017 Collection, Rio Tinto said in a statement. The company’s Argyle mine generates more than 90% of the world's pink diamonds, yet less than 0.1% of all the rocks found there are pink.